Raccoon Infestation: A Homeowner’s Worst Nigtmare? Spring has officially arrived, and many Torontonians couldn’t be happier. After a particularly brutal winter, the sun is shining, the birds are singing and the world is in bloom once again. There were many, however, who had more than the record low temperatures to contend with. These unfortunates are facing off against the city’s notorious creatures of the night, raccoons, which break into countless homes every year. They take refuge from the elements within your walls, under your deck and often in your attic or inside your chimney, transforming these areas and others into dens where they can safely give birth. The City of Toronto states that “raccoons breed from January to April; gestation is eight weeks, pups are born from March to June and the litter size averages three to five, which are mobile at seven to eight weeks old and are weaned by late summer.” They are largely inactive throughout the winter, and as a result many people are unaware that there are raccoons in their homes. They may start hearing movement – walking, thumping – and the sounds of screaming, crying, and the tell-tale chirping. These are unmistakable signals that they have established a den in your home. Threats posed by raccoons to the well-being of your home are numerous. Needless to say, they do not use the front door. Their entry is often accomplished by tearing through siding, vents or ripping the shingles from your roof. Once they’ve established their ‘den,’ they will tear up wallpaper, insulation, and ventilation ducts to assemble the necessary bedding material for their nest. Raccoons are by nature both very curious and very destructive. They are known to destroy air ducts, wood beams, cooling systems and pretty much anything else they can get their claws on. They will even chew on wires, compromising the electrical systems of the house and potentially killing the raccoons themselves – which will leave an almost unbearable odor that is difficult to remove. Their destructive curiosity is combined with amazing strength and the ability to climb just about anything – certainly a dangerous mix. The city has offered a great page filled with information as to how you can protect yourself and your home from this threat. Of course, even after safely removing the creatures and sealing the entrance points there remains the damage that was done to your home. Animal removal companies do not repair your heating and cooling systems, your air ducts or your vents. They aren’t going to bring electricians to resolve the issues created by the damaged wiring. And most contractors aren’t going to be very interested in such small projects. Odd Job specializes in projects precisely like these! No job is too small for us, and our professional handymen are well-suited to clean up the mess left by the invaders. 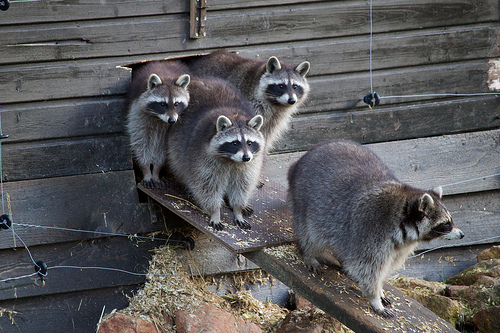 From within the raccoon stronghold of Toronto, Odd Job is on the front lines of the battle to help homeowners who have fallen victim to these fuzzy marauders! This entry was posted in Blog and tagged raccoon. Bookmark the permalink.